Hi there! For the foreseeable future I will be posting once a week so here’s what I have for you this week! Halloween, not so big in the UK as it is in The States but I think it is getting bigger every year – there certainly seems to be more in the shops every year! My kids get dressed up and I’ll take them trick or treating to family but that’s about it for us! We live on a lane which is the last street in our village before a short walk to the next village. I think this is the reason not many people venture round our way for trick or treating, so we end up being left with loads of candy (husband always insists on buying lots – just in case we have a mass invasion of little ghosties and witches knowing full well we hardly have any!) My family always give my kids way too much – in fact we still have some left from last year – I bet that’s yummy! (even though it’s still in date!) Anyways, getting back to my little treat bags that I have made. I love making these, I could make them all day long. This would be silly, however, as I have just said, we don’t get many trick or treaters so who would I give them to?!! I have made a few more since I took these photo’s so I will be giving these out to my kids and nephew. No doubt they’ll be getting some bigger bags of the sweet stuff too to go with these! 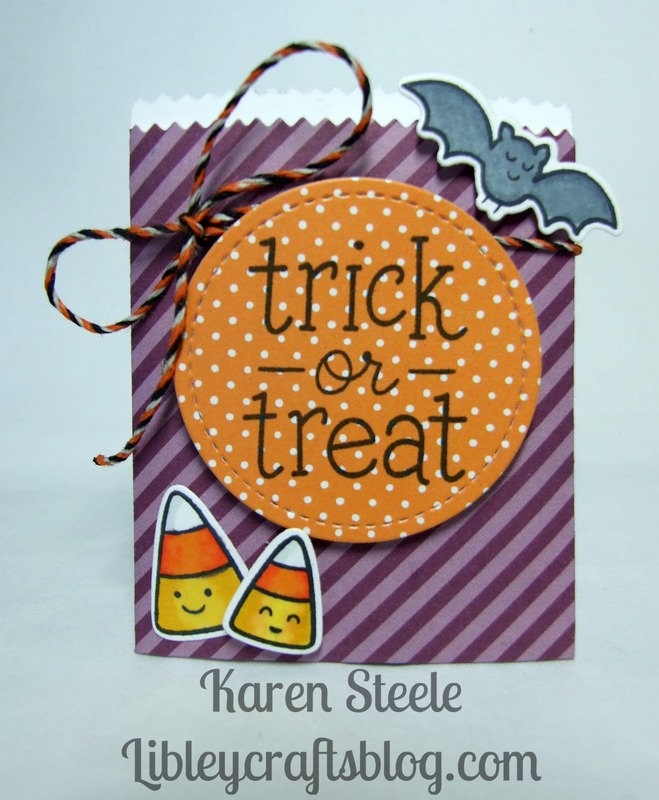 Supplies – Lawn Fawn: Trick or Treat stamps and dies, Holiday Party Animal stamps and dies, Party Animal stamps and dies, Spooky Hemp Cord, Perfectly Plaid Fall papers, Let’s Polka in the Dark papers, Scalloped Treat Box Die, Stitched Circle die and Forest Border die. Paper Smooches Deco Bag die, Reverse Confetti Tagged Tote die, Spellbinders circle die, black cardstock and Versa Magic Cloud White ink pad. 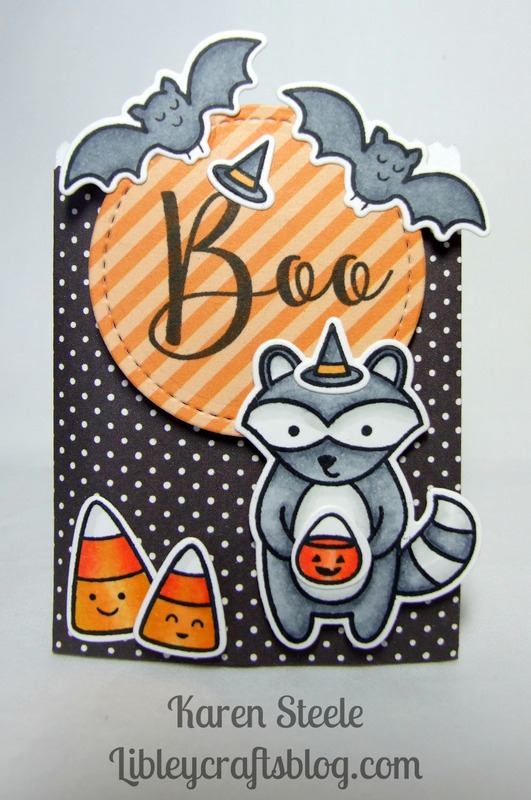 I also used the ‘Happy Halloween’ stamp from Clearly Besotted’s ‘Out of this World’ set and the Sophisticated Script alphabet set from Concord & 9th. Spectrum Noirs to colour and Memento Tuxedo Black ink pad. Yes, it’s a long list! Oh my goodness!! I want to come knock on your door at Halloween!! These are spooktacular Karen!! Love them all!!! LOVE LOVE LOVE these! I love Halloween and these are so fun that I may have to try something like this myself. Your coloring of the elopements is also awesome 🙂 Great inspiration so thanks! I do LOVE those little Lawn Fawn critters!!! 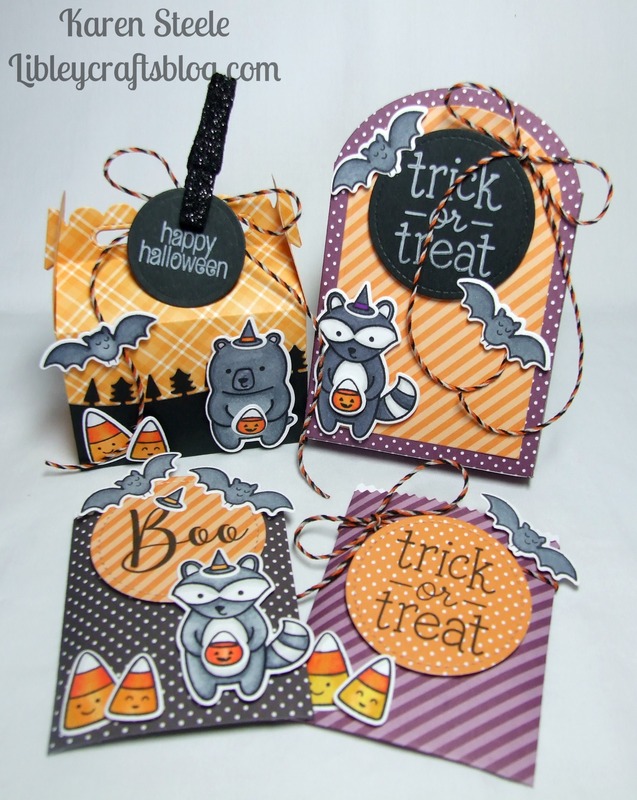 And, I LOVE how you incorporated them onto your tags and treat boxes!!! I NEED YOUR BRAIN! In a nice, non-scary way. These are awesome. Your kids and nephew are so lucky! Super composition and use of non-Halloween products too. Erm, did I spot a glittery peg in there as well? My screen is many feet away but I think I can see one? Lol! Thanks Gill! Yes you can see a black glittery peg! They are from the Forever Friends Classic Decadence range. The good thing about using these for my kids projects is that I get them back when they’ve had the goodies!!! It’s a win-win really and I’m doing my recycling bit!!! These are so cute, Karen!! Love them all! These are so cute, Karen! I love your mix and matching of the different companies crafty bits. Look at those little guys, they are brilliant! LOVE your Halloween treats, Karen ! Here in Germany Halloween is also not so popular like in the US and that is sag because i LOVE the colors orange, green, purple together !! I love seeing Halloween themed projects, I don’t make many as I don’t get to use them, which is a shame as they’re so many fun products out there. I know some give their Halloween cards to charity and organizations, but I don’t know of any that would need these around here. But I do admire your sweet Halloween stash and those who receive them will treasure them. Oh my gosh, these couldn’t be any cuter!!!! I LOVE LOVE LOVE them!!! !